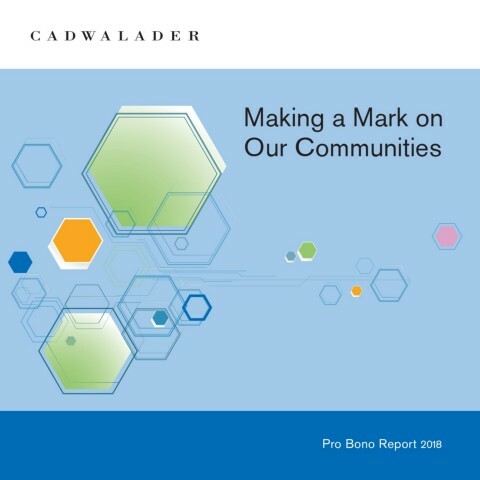 Over the past decade, Cadwalader attorneys and staff have incorporated and obtained tax-exempt status for nearly 300 not-for-profit organizations under the umbrella of the Not-for-Profit Incubator. We are proud to contribute to the vital work our clients perform. An international organization dedicated to ending acid burn violence at a global level. An organization that provides opportunities for underrepresented filmmakers, creating greater diversity in the film and television industries. An independent school that seeks to develop the full potential of every child through a curriculum integrating an intense arts education and rigorous academics. A program that provides formerly incarcerated individuals with counseling, tutoring and vocational training, and financial resources in order to reduce recidivism rates. A group that provides comfort, support, social engagement and encouragement to mothers who have suffered the loss of a child. A program that provides economically disadvantaged fourth through eighth grade students with the opportunity to perform in a Shakespeare play, learn and experience theatre, and develop life skills. An organization that educates and empowers women and girls of color to advocate for themselves and other disadvantaged groups through programming, trainings, and educational materials on social activism and community advocacy. A foundation that combats gun violence in communities of color and low socioeconomic status by providing gun awareness and educational resources to community youth, as well as support and resources to families impacted by youth gun violence.